With to be the largest living generation by 2019, millennial shave significant influence over the success of businesses in almost any industry. They are the fastest growing customer base, with in the U.S., and are expected to make up 44% of the workforce by 2022. It only makes sense for banks and credit unions to target millennials as they look to establish long-term customer relationships. The majority of this generation is now coming into an age where they’ve accumulated some savings and are looking to buy homes and start families. They’re at a prime time to join a bank or credit union, so they can manage all of their assets. What are the best ways for your business to reach this generation? According to the , 77% of millennials say their mobile phone is always with them. This means you need to have a strong digital presence - this is how your millennial targets are going to find you and learn more about your offerings. And, once you’ve got them, you’ve got to keep them by making mobile banking easy. Half of all millennials stated they would switch to another bank or credit union if they heard it offered a better app than the one they were currently using. Millennials expect to be able to complete the majority of their banking tasks from their phones, and if they can’t, there’s a good chance they’ll leave. While millennials won’t choose a bank without a mobile option, they also still care about the branch experience. A Bank Administration Institute (BAI) survey found that convenient branches are the top priority for millennials when evaluating banking products and other retail financial services. Branches give millennial customers a place they can stop by and speak with financial experts, who can often provide guidance more easily in person than via multiple emails or online chat messages. Because millennials care about mobile banking and branches, it’s important to make the experience seamless between the two. In the BAI survey, respondents said the top thing their banks could do to improve the customer experience was provide a “better omnichannel experience so I don’t always have to start over between channels.” Reduce the number of steps and forms you require customers to complete during onboarding so you don’t lose these millennials. Your marketing shouldn’t stop with millennials — Generation Z is coming up right behind them and is slowly gaining more purchasing power. This demographic includes anyone born between 1996 and 2010, meaning the oldest are recent college grads entering the workforce. Generation Z is similar to millennials in that their ; they’ll even sacrifice privacy to get it. This is a generation that has never really known a world without social media; they receive information in newsfeeds, captions, images, and comments. In order to reach them, you’ll need to filter your strategies through a social media funnel. Get closer to your customers and be transparent about your business to create a personal connection with Generation Z. You may want to consider tapping , as this becomes an increasingly popular way to market to younger generations. Targeting millennials doesn’t just apply to your marketing efforts; this should be a strategy that bleeds over into employee recruitment. 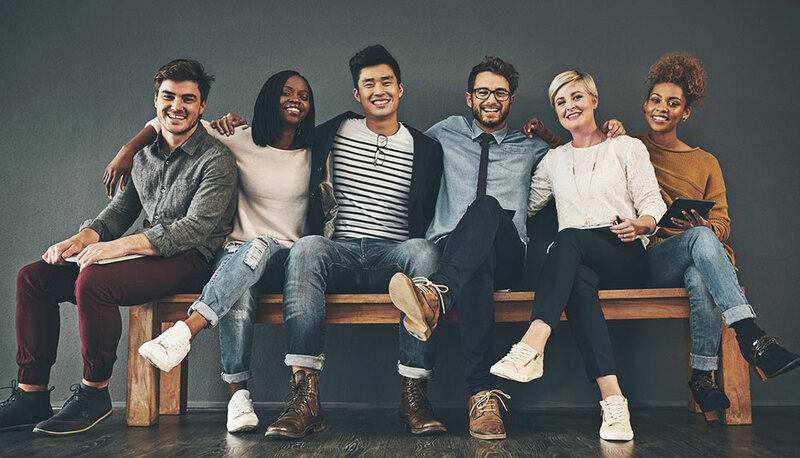 As the largest generation, millennials are more in tune with what the greater population wants than anyone else — you need these people on your team to make your business stronger and more relevant. Here are a few ways to attract and keep more millennial employees at your bank or credit union. First impressions are everything when it comes to new employees, if they’re unhappy. Your millennial employees are likely to be future-focused go-getters, with of joining a company. Make sure they’re aware of the growth opportunities available to them from the beginning so they can picture themselves with your company for a long time. In the same way that millennial customers expect onboarding to be painless, so do millennial employees. It’s important to strike the right balance between comprehensive training and information overload. Be sure they feel welcome, informed, and free to ask questions. While previous generations may have been more ambivalent about company culture, this generation is not. Millennials want to work for companies that focus on . It’s important to them for their work to have meaning, and for their employers’ values to line up with theirs. Highlight your corporate values and culture across all platforms, so prospects can see the heart of your company on display. Know that and read reviews from others about working for you. So, if your culture claims don’t match your employee experiences, you could be in trouble. Because millennials are more likely to be focused on career advancement, they thrive in an environment that cultivates ongoing learning. You’ll want to offer as many training programs as you can, so they have opportunities to expand their subject matter knowledge and skillset. This is especially important for IT roles, as many banks and credit unions have realized more success with training current employees in technical skills rather than trying to compete with tech giants like Google and Amazon for these candidates. If your millennials employees feel that you are invested in their futures, they’ll be more likely to stay around to get to the next level. 360 View wants to help you strengthen your millennial marketing and recruitment initiatives. Our provides all the tools you need to expand your footprint with this key demographic — CRM, marketing automation, profitability, and goals and incentives tracking. Watch our webinar for more strategies on how to attract, grow, and retain these relationships.